Home / Products / Seasonal / Easter Candies & Pops / Bunny Candy Corn, 1 lb. 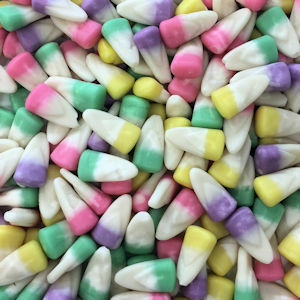 Bunny Candy Corn, 1 lb. Sugar, Corn Syrup, Confectioner's Glaze, Salt, Gelatin, Artificial Flavors, Honey, Titanium Dioxide (color), Sesame Oil, Yellow 5, Red 3, Blue 1 & Yellow 6.